We are HUGE fans of Kentucky Derby Pie. We have family in Louisville and we also lived there for a year so we know where to get the best Derby Pies! 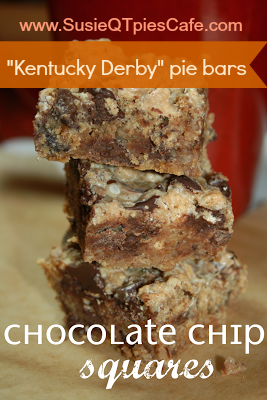 The original recipe is a "secret" but this Derby Pie Bar sweet recipe comes close to being perfect! These really are tasty. So why are they shaped like bars instead of pie? I'm not a big pie fan and rather have a square dessert. Also, you only need a small piece so the square accommodates that. A pie slice is almost too much of this sweet treat. I did make this for Valentine's Day and cut them into heart shapes. You can't do that with a pie! 1) Crush the graham crackers. I use a ziplock bag and smash with a rolling pin. You can also use a food processor. 2) In one large bowl, add all the ingredients and stir until moist. 3) Lightly butter or grease a 9 X 13 size pan. 4) Pour in mixture and pat it down. It will be sticky! 5) Bake for 35-40 minutes in a preheated 350 oven. You want them to no longer be sticky and slight golden in color. Don't over bake! 6) Let cool and then cut & eat! Use any shape cookie cutter if you want them in fun shapes. Use a variety of chocolate chips for the best taste! Experiment with varies chips! These sound delicious, thanks for sharing! I grew up in Kentucky, so Derby pie makes me think of home. :) I made some KY Derby pie inspired cupcakes for my blog this week. Looks delish! I love a good bar cookie. I'm visiting from Craft-O-Maniac. On the graham crackers. Is that 24 small rectangles. Like 4 little ones make up one big cracker. Or 24 big graham crackers?